Transparency Market Research has published a new report titled, “Automotive Seat Cover Market 2018 – 2026”. According to the report, the global automotive seat cover market is anticipated to surpass US$ 30 Bn by 2026, expanding at a CAGR of more than 3% during the forecast period. Numerous consumers are favoring automotive seat covers, as they enhance the esthetics of vehicles’ interiors. Automotive seat covers are gaining preference among consumers, as they safeguard the original car upholstery against stain and dirt. Rising demand for comfort and luxury is also boosting the automotive seat cover market. Young consumers prefer customized interiors for their vehicles and hence, opt for seat covers. Rise in the number of young consumers is boosting the sales of automotive seat covers. Increase in sales of luxury vehicles is also fueling the demand for automotive seat covers. Several consumers are preferring seat covers in order to safeguard their vehicles and minimize depreciative loss, as seat covers also protect the original seat upholstery. Rising awareness among people about preserving car interiors, in order to maintain the resale value, is driving the sales of automotive seat covers. Artificial leather or faux vinyl leather is highly popular in luxury and premium cars. Faux vinyl leather vividly resembles genuine leather; however, it is cost-effective and hence, witnesses a high demand. Faux vinyl leather is dirt-resistant, highly customizable, yet cost-effective, and thus, is anticipated to witness a robust demand during the forecast period. Vehicle sales across the globe have been rising for the last five years due to economic growth, which in turn is driving the automotive seat cover market. Increase in average age of vehicles is also boosting the demand for automotive seat covers. Asia Pacific and Latin America witnessed high demand for polyvinyl fabric (PVC) owing to its low cost. PVC fabric offers great flexibility and hence, can be tailored into intricate designs. Key factors that are expected to drive the demand for PVC are its cost-effectiveness and resemblance to genuine leather. India and China, being major producers of raw leather hides, are expected to witness high demand of genuine leather. Rising penetration of luxury vehicles in these countries is expected to drive the demand for genuine leather. Tricot fabric type is widely utilized in Asia Pacific, as it can be weaved at high speeds and hence, enables high production efficiency. The double needle bar Raschel fabric is estimated to witness high global demand, as it provides good esthetic value. The double needled bar Raschel fabric has a smooth surface finish and hence, is being increasingly preferred. 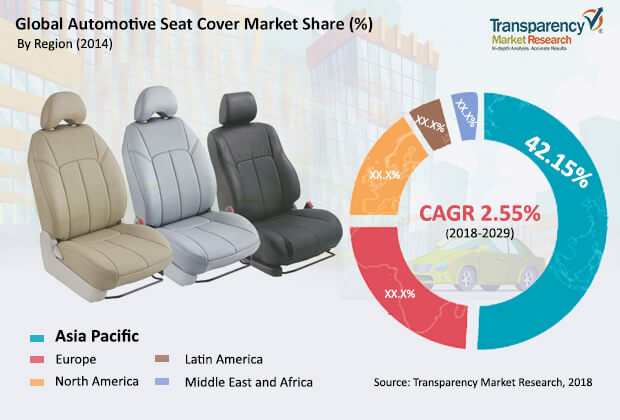 Increasing demand for various kinds of seats and consumer focus on vehicle interiors is boosting the automotive seat cover market. OEMs are entering into the aftermarket business, which in turn is likely to expand the automotive seat cover market. Countries in Asia Pacific such as India and China are witnessing high vehicle sales and hence, are lucrative markets for automotive seat cover. Several OEMs are also providing seat covers for passenger comfort; therefore, automotive seat covers are expected to witness a robust demand. High sales of light commercial vehicles in North America and Europe is also surging the demand for automotive seat covers. North America has consumers with high disposable income, which has led to market dominance of woven velour material type in the region. Woven velour is a high value fabric and is widely preferred in North America.